Bell & Plate Day featuring the £30000 Lloyd Motor Group Carlisle Bell and £30000 Cumberland Plate. 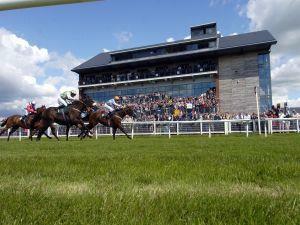 Carlisle's most prestigious day's flat racing! By road from M6 jct 42. Follow signs for Dalston. Follow the road for approximately 2 miles until you reach a staggered jct and turn right. The racecourse is approximately 0.5 miles on the left-hand side. By rail from Carlisle station the Stagecoach 01228 597222 operate a bus service to Durdar route 65 or 66. Alternatively the racecourse is only a short taxi ride away. By air Carlisle Airport is approximately 8 miles from the racecourse. Helicopter landing at the racecourse by prior arrangement only. Parking with charge at trackside on race day only. Notes Gates open 12.00 first race 14.00 last race 17.15 and bar closes 17.45.